Whether they are joining us for a few market Thursdays or all fourteen, we are happy to tell you more about our vendors and special guests for 2018! The following list is current as of this publishing, but be sure and stop at the market weekly – we accept new vendors and guests throughout the market season! Cash is the preferred method of payment, however, most vendors accept credit cards. To find out who will be at the market each week, be sure to check out our posts on the City of Seven Hills Facebook page. Backattack Snacks: Healthy-living snack company making delicious grab and go snacks using minimum ingredients while maintaining maximum flavor. Try our oven-roasted almonds or premium jerky! 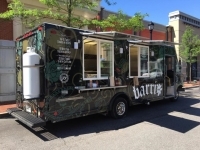 Barrio Food Truck: Will be at the Market on Thursday, July 12th creating the best tacos in town! Made from the freshest ingredients, Barrio’s is ready to satisfy your taco cravings; filling, flavorful, meaty, or vegan! Breads and Beyond Bakery: Located in Parma, Ohio we are a full service bakery that is known for our delicious Italian bread plus our other baked goods. Cecilia's Sweets: Offering handmade desserts and special Peruvian cookies. Cossel Farms: Seasonal vegetable farm in North Royalton. Also a provider of mulch, topsoil and firewood. Dirty Fingernails Nursery + Livin’ Greens/Microgreens:Perennial nursery specializing in hardy plants and nutritious microgreens. Information Booth: Find seasonal recipes, informational flyers, free weekly market raffle sign-up and other relevant resources. Canvas market bags, water and craft soda for purchase. Jimmy’s Jams: Offering a huge variety of carefully hand–crafted jams and jellies. Kernels by Chrissie: Gourmet popcorn and hand-crafted kettle corn made with fresh, high quality ingredients. All kernels are Ohio grown. Offering many unique and fun flavors. Kona Ice Truck: Enjoy one-of-a-kind gourmet Hawaiian style shaved ice made with pure fruit as the first ingredient. Serving at the Market on select Thursdays July, August and September. Look for the Kona truck! Little Birdie Wine Nest: Boutique wine shop located on Broadview Road in Parma, Little Birdie will be providing wine for the summer wine events at the Market, July 12th, August 9th, and September 13th. Purchase wine by the glass to enjoy during the Market or bottle to take home. A portion of the proceeds benefit the Seven Hills Historical Society. Luther's Farm Markets: Farm-grown vegetables, fruits and farm-raised meat from Richfield, Ohio. Marley Sophia: Handmade natural body products, made without preservatives, parabens, phthalates and synthetic fragrances. Deodorants, bath bombs, sugar scrubs, whipped body butter, charcoal clay masks, hand soap and more. Minimal ingredients make Marley Sophia products safe for everyone. Morning Owl Coffee: Offering locally roasted coffee, special Morning Owl blends and fresh brewed happiness! Nine Spoons LLC:We make hand-crafted soups in small batches in Cleveland. Unique family recipe. Wholesome, filling and excellent quality with locally-sourced ingredients. Wedding, Tomato Basil Bisque, Minestrone and more! Oak Tree Hydroponic Farm: Grower of superior-grade lettuce varieties including Bibb, Romaine, Green Leafy plus a host of herbs. All hydroponically grown free of pesticides and herbicides. Papou's Pastries: Authentic hand-made Baklava and other Greek pastries. Using the best baking ingredients available. Pierogi Pantry: Hand crafted artisan pierogis using the thinnest dough to always put the emphasis on our flavor packed fillings. Purple Skies Farm: We are a small farm with sustainable and naturally grown fruits and vegetables. We grow everything chemical-free. Ravine's Edge Maple Farm: A Veteran owned and operated Maple Farm in Media, specializing in premium maple products (syrup, sugar, candies) as well as soaps, scrubs and balms. R. Foote Family Farm: Six generations of farming in Brooklyn Heights, Ohio. Still family-owned and operated. Nothing beats a fresh-picked homegrown tomato! Scentsational Soap:Handmade vegetable based glycerin soap and other bath and body products. Swenson’s Food Truck:Will be at the Market on Thursday, August 9th serving up burgers, fries, milkshakes and other All-American fare including their famous Galley Boy, a double cheeseburger with two special sauces! The Honeyest One: Local beekeeper providing raw Ohio honey, infused honey, beeswax, and bee pollen.